PITTSFORD — Technology students at St. Louis School have traveled to Jupiter, the International Space Station and other far-off destinations without ever leaving their classroom. Such travel has been made possible through the use of virtual reality, which teacher Leonor Rivera incorporated into her fifth-grade technology class during the 2017-18 school year. After attending technology workshops and reading about the educational benefits of virtual reality, Rivera proposed her idea of using the technology to Principal Fran Barr. Rivera then inserted a letter in the school’s parent newsletter, asking for donations of gently used iPhone 6s, the main pieces of equipment needed for the initiative. In return, she received 16 anonymous donations. 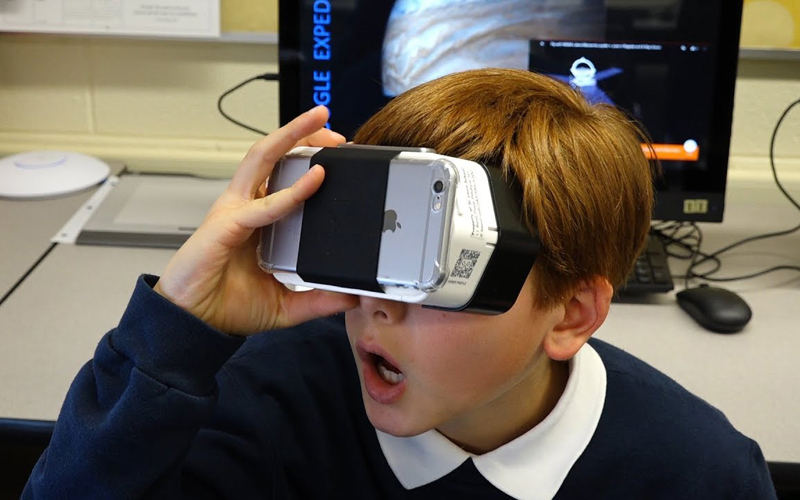 In her classroom, Rivera used Google’s Expeditions App (https://edu.google.com/expeditions), which contains several educational virtual reality tours, including the International Space Station, Aurora Borealis on different planets and the National History Museum in New York City. The app provides historical and factual information on each virtual expedition, she said. Using an iPad, Rivera led the class through the expeditions as students followed along using 3-D viewers attached to their iPhones. Rivera monitored the students’ behavior using the iPad and could tell who was viewing the material she wanted them to see. Rivera also has used such self-guided apps as the NBC Sports Virtual Reality App “Be An Athlete,” in which a student can view sports action from the athlete’s point of view, such as Olympic hockey and downhill skiing. A popular app among her students was a virtual reality tour of the White House, where the students used their headsets and viewers to tour the White House with President Barack Obama and first lady Michelle Obama. Rivera said the response to the new technology has been great, not only from students, but from their parents as well. For example, she said a fifth-grader who had taken a virtual trip to Barcelona could talk about the city with his mother, who had visited Barcelona during college. “She (the mother) told me that they had one of the best conversations as a family in a long time,” Rivera said. Due to such positive feedback, the school is considering using virtual reality with students in other grades.